Onion prices in India have sky-rocketed in the last few days. All the time, we weeped while cutting onions. 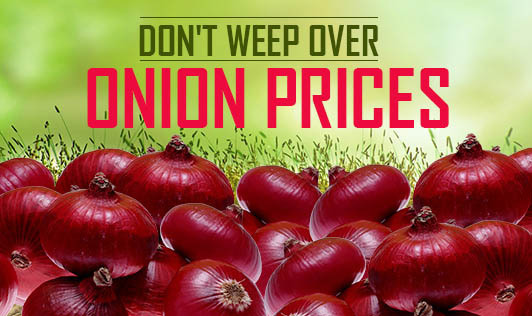 Now we weep over not being able to cut onions because of their high prices. Let's assume that this is only temporary and use alternatives in our cooking. Garlic, a close relative of onion, contains similar properties even though more pungent. If you don't like garlic, use other herbs and spices to enhance the taste of your food. Ask your friends (particularly from the Jain community) who avoid onion in their cooking to help you with tasty onion-less recipes. This is a good opportunity to learn new ways of cooking and new recipes. We are blessed with thousands of food varieties and let's put them to good use till onion prices come down to earth.